There has recently been a kind of "edit war" between users Wikipod and Eliyak, though they might not be aware of it, with regard to the classification of highways in Jerusalem. I think we should come to a consensus here, rather than having individuals change things back and forth indefinitely according to their personal vision. Meanwhile, Wikipod is classifying all urban roads as "tertiary" (yellow), except for continuations of officially numbered intercity roads, which are classified as secondary or primary. Problems with Eliyak's approach: The map becomes cluttered with major roads (which obscure other map features); urban roads are much more prominent than intercity ones (despite not being more subjectively important to map users); the frequent road type changes confuse drivers who would like to follow a single route; it seems to disagree with the general practice of OSM mappers around the world. Problems with Wikipod's approach: There is little differentiation between any urban roads of differing importance; it disagrees with the OSM official standard. My personal preference is for something in the middle, where a few major roads in each city are labeled primary or secondary, and the rest tertiary. I think there should be an emphasis on keeping through-routes a single color for their whole length. I see now that that Wikipod's approach is the "official" format for Israel, as documented at http://wiki.openstreetmap.org/wiki/He:M … es#Highway . Not sure exactly how official that is, though. At any rate, I never would have made my edits had I known about those guidelines. Better to discuss changes to the guidelines first, and see if that is necessary. I had originally thought that Israel's roads were not yet classified, or classified only through some imported data set. Well, I have to open with apology to Eliyak: I belive you have worked on this classification long time and i sorry for rechanging it.. But, the reason i did it is that most of GPS Nevigators (like my..) use the road classification as it mentioned in فthe GPS Data for choosing roads. What happend to me is that when I travelled from Bet-Shemesh to Binyamin Area, my GPS almost "took me to travel" in Jerusalem because of this classification. If i wouldn't knew the way by myself, i was surly stack in Jerusalem's traffic-signals. In addition, the colorful map little bit annoying for those who use the OSM Map as it is. I agree with eric22 that we have to find solution for this problem: not all road in the cities are same, and it's a fact that the main streets in Ashdod etc. (that are marked "tertiary") are more burdened than many road in the south district that marked "secondary". I did not know about the Israel-specific wiki page, that is good to see. The problem with main city roads is still outstanding. Perhaps we should change the specification for road types in Israel. Currently the wiki page says "Triple digit roads are Secondary"
Of course we could change the wiki page as it is only representing the current status of definitions. But whatever needs to be changed should be part of a discussion. "Triple digit roads, and very large roads in urban areas, are Secondary"
is that it is not very clear defined and the user can define by himself what road is secondary and what is not. Like currently with the tertiary roads. I think we should be very strict in this definition and should avoid a blurry definition like this. Certainly we should decide this by consensus after a discussion. The wikipedia pages simply list roads by the number of digits. While the current Israel road definition is very clear (number of digits), the definition for the rest of the world is much blurrier (http://wiki.openstreetmap.org/wiki/Highway_tag_usage) so maybe that is OK. And we could remove much of the blurriness by further specifying, for example "In general a city should have approximately one secondary road per 100000 residents, not counting numbered roads." This upper guidelines are not the one belonging to Openstreetmap Israel, but I agree that we don't use all possibilities we have to reconsider the definitions we made in the past. Currently there is no trunk defined, so of course we are missing it on some kind of level. I know that that wikipedia (http://en.wikipedia.org/wiki/List_of_highways_in_Israel) is only showing a list of primary roads in Israel. But based on what I see we could get a better and more detailed road definition than we have today in Israel. TRUNK - all expressways (example on http://en.wikipedia.org/wiki/List_of_highways_in_Israel with red sign on the left). Can have 1, 2 or 3 digits ref. SECONDARY - striped w/ 1 lane each way, infrequent if any stop signs and. Beside that all routes with 4 digits. TERTIARY/ TERTIARY ( - other main route or road inside of the city / village etc. The image with the number and the colors on the left are shown on streets signs within Israel. The colors are also shown in all Wikipedia articels. The coloring of the Names : MOTORWAY / TRUNK / PRIMARY is the default color in Openstreetmap (Potlach etc.). The changes I'm suggesting are really big and would mean that a lot of road definitions have to be changed. So I was checking around for more information. And in the bottom of this post you can see some interesting postings regarding the road definitions in Israel. Please see below images from Israeli Highway signs showing the difference of the roads in the real life that doesn't exist in Openstreetmap. Motorways have blue signs, and most other intercity highways have green ones. The latter can be very close to full motorway standard, like the Geha highway (part of Road 4), which is a very large 6-lane all-interchange urban highway, but which is not classified as a motorway. The reason for this, I think, is that there are two petrol stations by the road, which are too close for a motorway. The section of Road 1 which is nearest Jerusalem is not a motorway. It does not have any traffic lights, but I think some of the curves are too tight for full motorway standard. The big difference between Israel and, say, the UK, is that the color of turn-off signs is that of the destination road and not that of the road they are on. In other words, a motorway sign directing you to a non-motorway highway would be green, not blue. The only blue signs on the motorways are either those showing distances, introducing interchanges, or directing to other motorways. 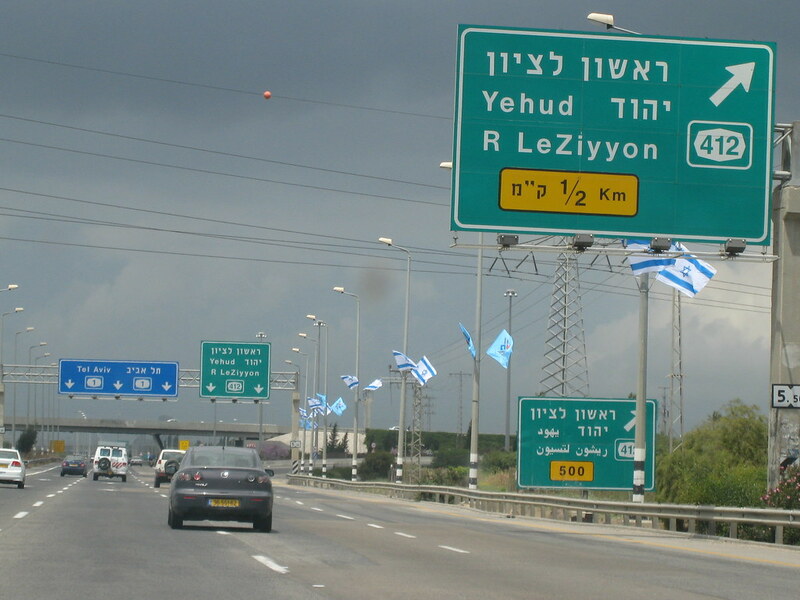 True freeways in Israel are recognized by the European blue "motorway" sign, and they actually use BLUE signs, as you might have spotted in some of the pictures. 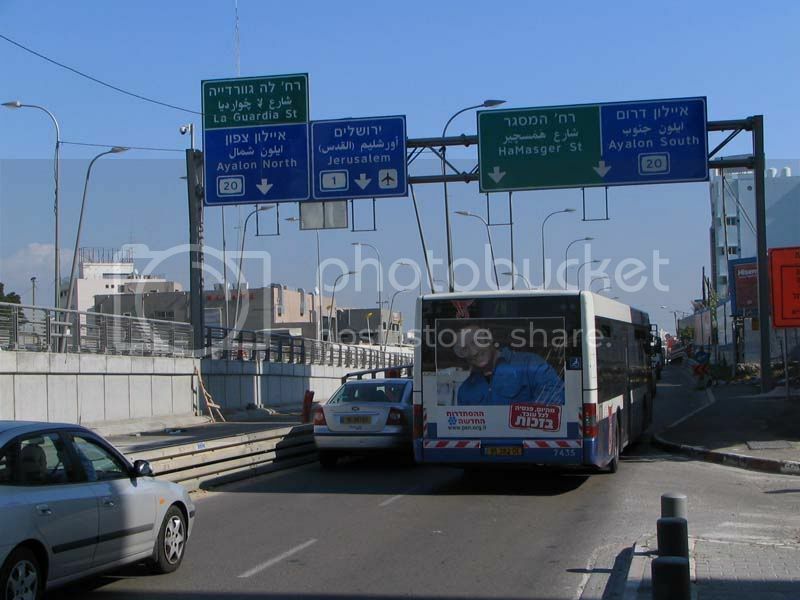 However, many expressways in Israel are not classified legally as freeways (often they are built to motorway standards, but they may contain several at-grade intersections, that's usually the main reason), and they use green signs. As a result, the majority of roads in Israel use green signs and are not officially classified as motorways. Also, on true motorways, usually signs describing destinations off the freeway are in green signs, because they refer to exits to non-motorway roads, whereas right beside them, the sign that tells about destinations if you continue driving on the motorway (with arrows pointing directly down), would be blue in this case. Lastly, the official speed limit on a "blue" motorway is 110km/h by default, even though to this day in most places there is a 100km/h limit enforced by signs, except for highway 6. On the other hand, most "green" dual carriageways have a limit of 90km/h. The categories you use - "expressways", "regional roads - numbered with three digits", " striped w/ 1 lane each way, infrequent if any stop signs" etc. are somewhat unclear, and worse, often overlapping. That is why I suggest staying with the current system, which uses the number system except in a few cases where a specific change is needed (freeways are "motorway", near-freeways are "trunk", and as I now suggest the largest urban roads are "secondary" not "tertiary"). I understand your point. It sounds that the new definition of highway, trunk and primary are unclear as you can't know the declaration of the street just by the amount of the digits or by a sat image. But this is how the government of Israel is currently declaring the streets levels. There are roads looking like a motorway, but they are defined as expressway (trunk). And highways in Israel do not have just one digit. So definitions based of digits are wrong and not correct! Road 20, 22 and 431 are highways. And currently also defined as highways in OSM. This is already not following our street definitions we made some years ago. This way we would avoid for example the kind of edit war" between users Wikipod and Eliyak, because we would map like on ground facts. No discussions anymore what is a freeway and what is not. Because we have a gap for highway, trunk and primary there is simply missing one declaration level today to define more important roads in the cities. This is why I don't see a possibility to define SECONDARY roads inside of cities in the moment without changing the upper street levels. BTW I'm very open for discussions for the SECONDARY and TERTIARY as I'm not sure how to declare it the best way to fit our needs. I would prefer merging the 4 digits roads and important city roads to SECONDARY. And you are right that SECONDARY roads should not have to have separated ways to each direction. Ah, now I understand what you said. 1) Where would we get information about the road types? Google Maps has each road number with the appropriate color, but of course we can't use it as a source. 2) Looking on Google Maps, it appears that the road color is almost always what you would expect from the number (2-digit=red, 3-digit=green, 4-digit=brown). The main exceptions are freeways. But freeways are already an exception in the current system. 3) So the main difference between your suggestion and the current system is that you move everything up one class (primary->trunk, secondary->primary, tertiary->secondary). The benefit of this is that there is no "gap" with no roads classified as "trunk". One loss is that the higher classified roads use too much space and stick out in Mapnik. A bigger loss is that relatively small roads outside cities are marked as more significant than big roads in cities, which is bad for route calculation. Overall, I'm not sure the change is worth it. 4) And there is something useful we can do with "trunk" - we can use it for road that are "almost but not quite freeways", like 471 and 531, and 4 near Raanana. This means some interchanges on the route, but some intersections too. This is the convention for the US for "trunk", while Canada and South Korea have similar conventions. 5) I don't think there should be any debates about what is a freeway - a freeway has interchanges and no traffic lights, a non-freeway has traffic lights. 1) I would prefer to define the streets by its digits first. If somebody realizes a difference between digits and street definition he will have to change it and let us know. We will have to keep track of those abnormal streets. It would be amazingly great to have a list of all streets with digits that would be generated automatically. 2) But if there are exceptions we will need to handle it. The rule digits = road definition is not correct. This is what we already found out. So the correct way to define the way is not the digits but the color of the sign. This is my point for the whole discussion. 3) Yes, I would like to move it up and have a clear definition for the important Israeli streets. 4) In my opinion this is exactly the opposite of a clear definition. Who defines that the road 4 near Raanana should be trunk and not primary? I would not know an argument to discuss with somebody the difference. A bigger loss is that relatively small roads outside cities are marked as more significant than big roads in cities, which is bad for route calculation. In my opinion they are more significant. It will take you drive more time for the same distance on a 6 lanes road inside of Tel Aviv with traffic lights with a speed limit of 50 km/h than using the small 2 lane road outside of the city that has a speed limit of 60 km/h or even 80 km/h. So I hope the routing would guide me on that route instead through the huge city road. I'm not very sure on this max speed theory. This needs to be cross- checked. First rule for numbered roads: It doesn't count the amount of digits but the color of the sign! => MOTORWAY (Blue sign)- all freeways - National roads and Inter-City roads. Normaly they have one digit (example road 2) or two digits (example road 20). As a exception they could have also three digits (example road 431). Speed limit is 110 km/h if no sign defines something lower. => TRUNK (Red sign) - all expressways. Expressways in Israel could look very much like a freeway. Normaly they have two digits in the sign (example road 10). Speed limit is 100 km/h if no sign defines something lower. To avoid editing wars it always counts the color of the sign. If its blue it counts as freeway. If its red it counts as expressway. => PRIMARY (Green sign) - all regional roads. Normaly they have three digits in the sign (example road 412). Speed limit is 90 km/h if no sign defines something lower. => SECONDARY (Brown/ Black sign) - all regional roads. Normaly they have four digits in the sign (example road 4111). Speed limit is 80 km/h if no sign defines something lower. [Exception per Eric22 request]: very large urban roads that are unnumbered (generally around 1 per 100000 inhabitants). Roads that are more important for routing connections that a normal tertirary road. TERTIARY - all importand (connection-) roads (no colored sign) . I completely agree with MrIsrael, let's define all from sign colors, and not from other properties. If we'll meet any really problematic case - we'll just discuss it here. There is one remaining thing I'm not happy about with this suggestion. There are a number of urban roads that are very large (sometimes 3 lanes in each direction). According to a strict sign color division, these would all be tertiary. According to my suggestion which was adopted by Mr_Israel, these would be secondary. On the other hand, there are many non-urban numbered roads, even with red signs, that are only 1 lane in each direction. Often they don't even have traffic lights when they meet other. So these roads would be classified as "trunk", while the much larger urban roads would be classified as "secondary" or lower? This just doesn't seem right to me. That's why I'd prefer for the sign colors to refer to one level lower - red sign=primary not red sign=trunk, and so on. This decreases the mismatch between the road levels. What then should we do with the trunk level? Earlier I suggested roads with "some interchanges" being called trunk, but I would also be fine with not using trunk at all. Who says we have to use every level? eric22, your proposal reminds me "mapping for renderer". You propose to map for navigators. Why to not get navigator software to check max_speed, lanes and traffic light tags and assume which between two roads is better? Also, we have very nice tag http://wiki.openstreetmap.org/wiki/Prop … l_maxspeed where you may tag actual state of things on specific road, and propose to osmand developers to use this tags. Eric, why is the width or a existing traffic light of a road so important to show on the map? Isn't it more important to highlight important roads on the map and let the user or software choose which road to take. I agree that we would have streets for example road 4 in the Negev where you can drive up to 90km/h on a small road with only one line per direction that are not even separated. This would get the trunk classification. And your 3 lines in each direction urban road that allows only 50- 60 km/h would get "only" a secondary. For Israel the road 4 has a lot higher importance than this urban road. The connection between cities is something you would like to see right away on the map and the urban roads are less important even if they are bigger in size in real. By using the new classification you can highlight roads like in Hadera that connecting important roads and should be preferred to other small roads by using secondary definition. This will give us more freedom and a good and strict rule everybody can follow. Currently you can not see 4 digits roads highlighted at all on several zoom levels. I don't look on the trunk definition like it must be used at all. I simply realized that we are using motorway for motorway, primary for 2 digits roads, secondary for 3 digits road and 4 digits roads TERTIARY. There is simply missing one step to distinguish between a main city road and a road that received a 4 digits numbers. Several 4 digits street are generally linking smaller towns and villages. Those streets should be preferred over normal TERTIARY ways, thats why they received a number. => Important roads that aren't motorways. Typically maintained by central, not local government. Need not necessarily be a divided highway. In the UK, all green signed A roads are, in OSM, classed as 'trunk'. So for the UK there is a green sign (thats why its green in Mapnik) that declares the street to be a trunk road. http://wiki.openstreetmap.org/wiki/Ireland/Roads => National Primary Routes (N1-N40), regardless of build quality. Summary we would not be the only country that uses trunk for non motorway like roads. But I agree that the current Mapnik rendering is not Israel friendly. The green trunk would need to be red. The red primary road would need to be green. The orange secondary would need to be brown. I realized today that a lot of street definitions has been changed in the last week. Some of the definition is based on our new suggested rules and some others are simply wrong and doesn't make sense. As he went through several countries and "fixed" things I would like to reverse all his changes in Israel. I have wrote him a email and asked him to stop it and refereed him to this thread. Can anybody reverse his changes? Beside that it would be really great to finish the discussion on this thread and get to a consents. We have this thread open for over a month already. I see this man done more than one changeset in Israel area. He not only changed road types, but also deleted some nodes and roads. I'll try to undo his changes in our area at evening. I opened a new topic http://forum.openstreetmap.org/viewtopi … 16#p262616, let's discuss there all our reverts. I completely agree with Mr_Israel's proposal. This airport freeway like road has no ref ID at all. So I also expect it not to be a blue sign. All other map providers do not show this road as freeway. For them its only SECONDARY or lower.